This antibody reacts with a 75 kDa melanocyte-specific gene product, identified as Tyrosinase-related protein-1 (TRP-1). SK-MEL-23, SK-MEL-19, SK-MEL-30 cells or Melanoma. 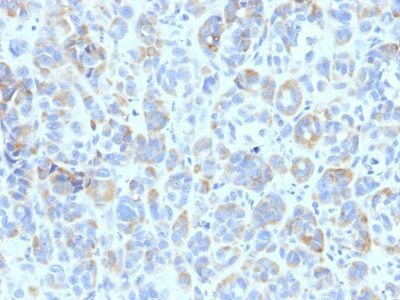 This antibody reacts with a 75 kDa melanocyte-specific gene product, identified as Tyrosinase-related protein-1 (TRP-1). It is involved in melanin synthesis. TRP1 is present on the melanosomal membranes of melanoma, normal melanocytes and nevi.Recent evidence suggests that TRP-1 is involved in maintaining stability of tyrosinase protein and modulating its catalytic activity. TRP-1 is also involved in maintenance of melanosome ultrastructure and affects melanocyte proliferation and cell death. Catalog number key for antibody number 0806, Anti-TRP1 (TA99) The prefix indicates conjugation, followed by the antibody number and size suffix.